Even if you’re not a particularly religious person, you’ve probably celebrated Easter at some point in your life. And besides its religious meaning, Easter is always a great opportunity to visit friends and family, eat loads of home cooked food and generally be merry. But Easter is also a great time for traveling, especially if you are planning to go to countries where Easter is celebrated in a completely different way. 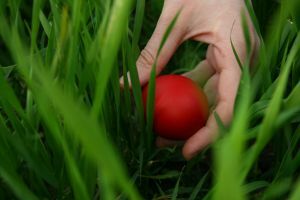 Easter traditions around the world vary a great deal, despite the fact that the essence of the holiday is the same. 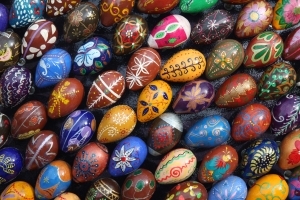 Here are some interesting Easter traditions from around the world. In Mexico, the celebration begins a week before Easter Sunday, on Palm Sunday, and the week between the two is called Semana Santa, or the Holy Week. In many communities, people will stage an entire play reenacting the last days of Jesus: the Last Supper, the betrayal, the judgement, the procession of the Cross, the crucifixion and the resurrection. In some very religious communities, real crucifixions and flagellations will be played out, but there are really not recommended to the faint of heart, as they tend to be quite bloody and unpleasant. In Hungary there are lots of age-old traditions that are still very much alive in rural communities, for example dying eggs and painting them with exquisitely intricate patterns. Easter pastries are also baked in large quantities, and more often then not they will be taken to the church on Sunday to be blessed. Easter Monday is also called Ducking Monday, when boys and men will sprinkle water (or perfume) on girls in exchange for eggs and sweets. In France, children hunt for eggs on Easter Sunday morning. 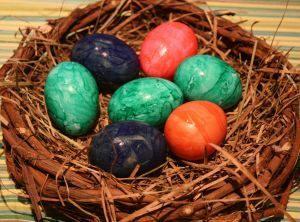 Parents usually hide eggs around the house, or in nests that the children make in their backyards. It’s said that the church bells go to Rome on Easter, and when they come back, they bring eggs for the children back with them. Children sometimes play games with their eggs, like throwing them in the air and trying to catch them (those who drop their eggs lose the game). On Easter, the Christians in India hold lavish parties and cook delicious dishes for the occasion. The exchange of gifts between family members and friends are not uncommon, and colorful lanterns or small crosses are also sometimes given as gifts. In Goa, Easter is celebrated through festivals and elaborate church services, and as in many other countries where Easter is celebrated, dyed eggs and chocolate easter bunnies often accompany the Easter feast. Like in other European countries, the Czechs take a great deal of pleasure in decorating eggs in vibrant colors and delicate patterns. The Monday after Easter is called Whipping Monday, named after an old tradition that requires boys to whip the legs of girls in exchange for dyed eggs. In Prague, every year there’s an Easter egg contest where you can see some genuine works of egg-art.